The real reason you should be concerned about "Planet Hillary"
You get it. The cover of this week's NYT Magazine is a mess. But here's a criticism you probably won't see debated on late-night TV: have you noticed how painfully, unforgivably, idiotically inaccurate it is, from a scientific standpoint? 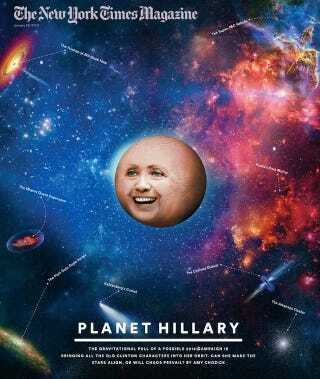 When we created the cover of this Sunday's magazine to accompany Amy Chozick's article... about Hillary Rodham Clinton's influence on the various people within her political universe, the immediate idea that came to mind was Clinton's face embedded on a planet. Okay sure, yeah. The immediate idea. Claire: not, quasars or star clusters!! me: do planets even smile??? because they are trying to say that all these things are "in her universe"
and like "things revolve around her"
We can't. We just can't. You'll have to read the rest for yourself over at The Hairpin.